Again we see what a difference a week makes … some of the food-related companies hold down the Materially Stronger fort — but keep in mind that Zhongpin (HOGS) is likely on its way to going private at $13.50. Educational Services once again provides us with the usual list of suspects as the industry continues to get shellacked. Notable by their absence from the Materially Weaker list are DeVry (DV) and Strayer Education (STRA). Perhaps the triage is starting to take hold? 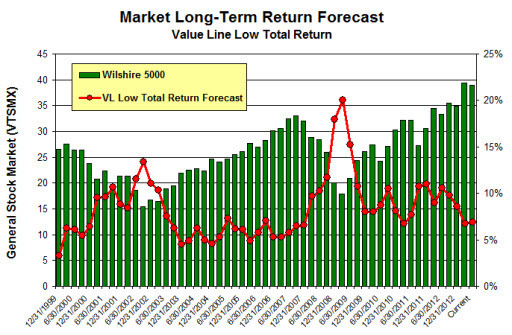 The Value Line low total return forecast is 6.8%, compared to 6.8% last week.